Was a wonderful day here in hot hot hot Kumasi! Kumasi very West African, with the roadside shacks, dirt paths through small, poor neighborhoods (settled outside the walls of large estates), and wonderfully kind people walking everywhere. It is so wonderful to be here and see such a different side to this city, than I have ever seen before! We started our day in meetings with Abenaa and Hannah, the leaders of MCI Kumasi, as well as Emelia, the department of education appointee for girl-child education in Kumasi. Abenaa and Hannah gave us very valuable insights to the challenges in Kumasi, in terms of high drop out rates amongst girls, school fees, lack of technology, and need for incentive to make our programs possible. 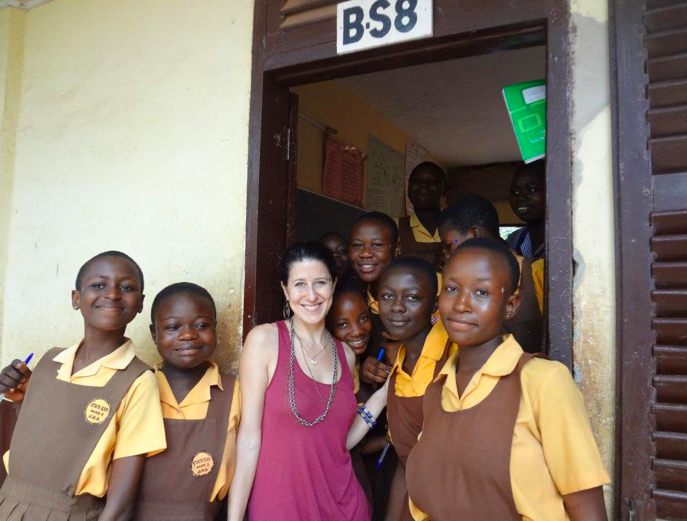 Emelia also filled us in on the work that is being done to promote girls' education in Kumasi. We were able to share about World Read Aloud Day with all of them, and hopefully Kumasi will be able to join in some way. Abenaa and Emelia will be joining us again at the end of the training of the 30 facilitators and girl-child coordinators from the 15 schools where we work in Kumasi, and will be handing out the wonderful certificates Dorothy made for us. After our meetings, Denise and I traveled to Opoku Ware JHS. Opoku Ware is where two of the three trainers of trainers (Annas and Adjoa) that I connected with on Skype ahead of the project work and run Girls LitClubs. 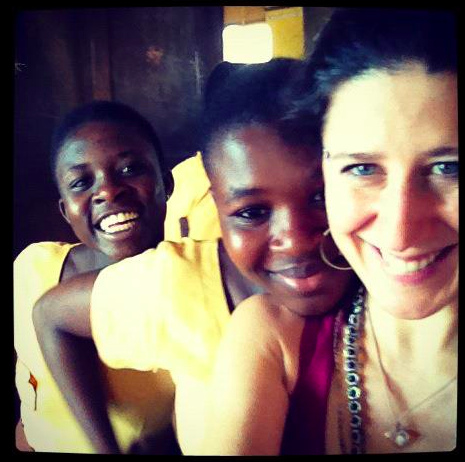 We met Annas and Adjoa, as well as their other co-facilitator Abby, at the school. We also met Eugene, the head teacher (principal) who Hannah has informed us is a huge force for MCI programs in Kumasi, a supporter of our work, and a motivating force for other head teachers and schools across the city (according to Hannah - he gets it done!) They were all so wonderful and excited about LitClubs, WRAD, and the impact LitWorld is making on their schools. Opoku Ware's LitClub was WONDERFUL! They sang a great rendition of the Hello Song, and one girl named Dorcas led the club in a song she had COMPOSED about the Seven Strenghts (it's on video - don't worry!) We then discussed what they are learning in their girls club, and the girls discussed strenghts such as belonging, confidence (Dorcas credited confidence as inspiring her son! ), and hope and what they mean to their lives. We went straight into the Dream Poem, which really touched my heart because these girls in particular were so selfless and concerned with others. Manuella dreams no children will be on the street - all will be in school. Irene dreams all girls will be independent and fight violence. Hillary dreams of helping people in need. Keren dreams of a library for her school. Akosua dreams of enforcing girl child education in Ghana. Dorcas dreams we will be confident enough to show the world what we are made of. We must learn hard to make our dreams come true. After the poem, we read Chrysanthemum (the girls LOVED it!) and passed out post-its. The girls each wrote their name and one thing the love about themselves on it (Denise's great idea - I took a picture of each girl with hers, but I only had my phone at the time so I am not sure how great they look). We shared, and then discussed World Read Aloud Day, and I gave them a copy of Snowy Day to use in their celebration. Finally, since we had extra time (Denise was at Kindergarten and they were delaying us with their cuteness!) we did a quick question and answer session. I got q's from my favorite color to what I wanted to be when I grew up, to what I would say to someone who was underpriviledged, to if I would marry a Ghanaian. It was so sweet! We ended with the hello song, and I felt so uplifted by how wonderful these girls were, how brilliant they are, and how much they love the club. We visited three more clubs (two combined as they were on the same campus) in the afternoon. We did a shortened version of our lesson from the other clubs, with the Dream Poem, the book I Like Me!, and a discussion about WRAD. They all speak of the importance of being kind, of working hard to achieve our dreams, of loving our fellow sisters, and of the joy of reading. In each place, we were humbled by the girls willingness to share, their love of learning, their curiosity about the world around them, and their desire to make the world a better place. It is always astonishing to me that girls who have so little can want to give so much to those around them.